(Entertainment Weekly) -- In what feels like a box-office weekend from "The Twilight Zone," a low-budget and critically acclaimed movie with no stars and an unknown director managed to top the charts. 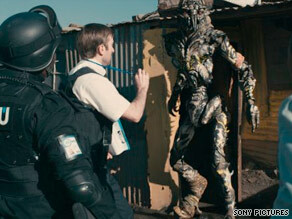 "District 9," the alien action pic produced by Peter Jackson, crushed the competition grossing $37 million. "District 9," the alien action pic produced by Peter Jackson and directed by the 29-year-old Neill Blomkamp ? who shot the film in Johannesburg, South Africa, of all places -- crushed the competition by grossing $37 million, according to early estimates. Audiences clearly enjoyed what they saw too: "District 9" has already soared to No. 78 on IMDb's top 250 movies list, although it'll obviously drop some as the initial euphoria wears off. Second place went to "G.I. Joe: The Rise of Cobra," which dropped 59 percent in its second weekend but still managed to recruit $22.5 million. The $175 million action movie should pass $100 million domestically by Monday. "The Time Traveler's Wife" materialized into third place with $19.2 million in its debut weekend, proving that there is a market for watching Eric Bana disappear. Rounding out the top 5 were "Julie & Julia" (No. 4 with $12.4 million) and "G-Force" (No. 5 with $6.9 million), respectively. Also opening wide was a trio of movies that failed to make a significant dent on the box office. "The Goods: Live Hard, Sell Hard," a cars-salesmen comedy starring Jeremy Piven, barely registered on the mercury thermometer by earning $5.4 million. "Ponyo," the 10th film by Japan's animation auteur Hayao Miyazaki, grossed $3.5 million on 927 screens. While that amount represents Miyazaki's best opening weekend in America, it's still fish feed compared to "Ponyo's" worldwide gross of $187 million. The music comedy "Bandslam" won't be getting any requests for encores after making only $2.3 million from more than 2,000 screens ? even the promise of seeing the "Taylor Lautner takes off his shirt" trailer of The "Twilight" Saga: New Moon couldn't save the Vanessa Hudgens movie. In limited release, the Jimmy Page/The Edge/Jack White music documentary "It Might Get Loud" opened promisingly, grossing $101,000 from just seven theaters. And "500 Days of Summer" continues to cement its title as "the indie breakout of the summer" by charming $3 million more from moviegoers, bringing its total to $18 million so far.